On a really long tarp, people pitch the sides as doors. Some have doors. Other people have a "beak". I have seen people tie their rain jacket or rain poncho over the top of one hiking pole at one end instead. I like that olive green color. That catenary-cut tarp gives a taut pitch. Is cuben "noisy" in a breeze or in windy conditions? Thats a big negatory on the noise question. Cuben is very quiet. It might look crinkly but its really not. Are you familiar with the spinnshelter? I got a used one for cheap last year and I really love the design. 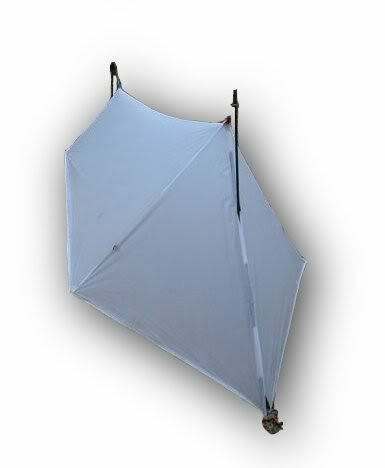 It is similar in shape to the SL-1 except that poles do not go inside the tarp. It has a velcro closing beak on front and a velcro door on the back end. This enables you to close it up in gnarly or cold weather, but they can be rolled up and stowed out of the way in nice weather. I am trying to install these same type of closures on my bomber tarp. I got the AsymTarp 1 so I can roll-in one side. I will find out how that works out. It isn't just the pole. I don't like to wiggle in the ends, and, I feel so confined in an A-Frame. The trekking poles on the outside look like an "improved" design. You could move it over a bit, until you get inside. The doors: are you going to glue, tape, or sew ? The Kifaru paratarp shows viewtopic.php?f=60&t=4539&hilit= has an added door vestibule with a stove jack and stove pipe for a small wood stove. I mention it, because the photo may be interesting as how that door is attached. How about The Stump for a wood stove and to go coffee mug, as well? I decided on aluminized nylon for the reflective surface, tied in place. I can use the same reflective cloth panel on the inside tie-outs of my Shangri La 3. I am hoping the aluminized nylon will act as a windbreak/dew cloth/reflective surface. I have had this waistbelt pack for a roll-top bag insert for kayaking. The Vargo Titanium 750 Sierra cook kit, I put together, fits in the pocket. The Oware AsymTarp 1 and Ti-Goat Bug Net Bivy and NeoAir XS and Gossamer Gear PolyCro ground sheet are shown inside the Seat To Summit Laundry Bag inserted in this waistbelt pack. Here it is packed "fluffy". The fact is, the Oware AsymTarp 1, Ti-Goat Bug Net Bivy, NeoAir XS stuff sacks, provided, and the Gossamer Gear PolyCro ground sheet pack so small, it would take a "fluffy" sleeping quilt to decently fill out the Sea To Summit Laundry Bag for the photo. I haven't decided on the Sea To Summit Laundry Bag. I think the bag could be 2-4 inches taller and still be a waistbelt pack. I decided to show "the goal". I am assembling a "10 Essentials" UL waistbelt packed outfit for walking away from the car to explore a scenic roadside landscape, with the Oware AsymTarp 1 is the shelter, if caught out in inclement weather. Other ideas would work, as well. I am showing my idea development, here. Nice.....I count 6 of the 10 essentials Am I right?